EN Get the full scoop on knife throwing: Thrower (50+ articles), Sticking Point (40+ articles) and KnifeThrowing.info (100+ articles) have you covered. 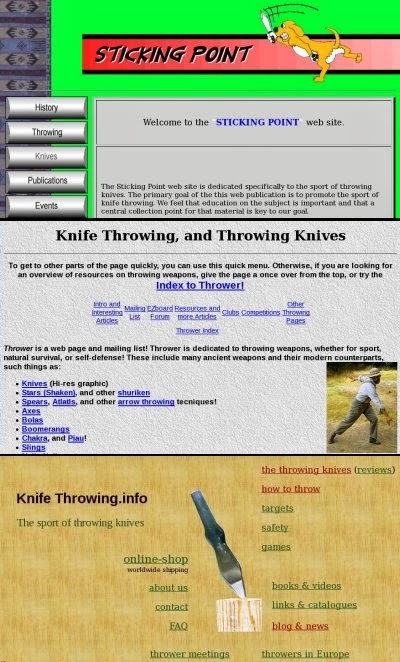 While KnifeThrowing.info is alive and growing, the older and trueley pioneering sites Thrower and Sticking Point are available as static archives. Their creators, Matthew Rapaport and Tim Valentine, couldn't maintain them any longer, and were very happy to see them rescued from digital oblivion by KnifeThrowing.info. Now, when you don't understand those throwing instructions, you can easily get a second opinion - and a third. DE Alles über das Messerwerfen lernen - diese drei Seiten machen es möglich: Thrower (50+ Artikel), Sticking Point (40+ Artikel) und Messerwerfen.de (100+ Artikel). Während Messerwerfen.de noch wächst, sind die bahnbrechenden (englischen) Seiten Sticking Point und Thrower nun als statisches Archiv zum lesen verfügbar. Ihre Betreiber, Matthew Rapaport und Tim Valentine, konnten sie nicht mehr Pflegen, und waren froh dass sie Messerwerfen.de vor dem digitalen Vergessen gerettet hat. Wer jetzt eine zweite Meinung braucht zu dieser Messerwurf-Anleitung, bekommt gleich zwei. FR Savoir tous sur le lancer de couteaux: C'est possible gràce à Thrower (50+ articles, Anglais), Sticking Point (40+ articles, Anglais) et KnifeThrowing.info (100+ articles, Allemand/Anglais). Le site KnifeThrowing.info est bien vivant, alors que les sites pionniers Sticking Point et Thrower sont disponible dans les archives. Leurs auteurs, Matthew Rapaport et Tim Valentine, ne puvaient plus les soutenir, et ont été bien heureux quand KnifeThrowing.info les à sauvé de l'oubli numérique. Maintentant, quand il vous faut une deuxième opionion sur le lancer, il y en a deux.